250 pieces of Lake City headstamp military brass once-fired, fully reprocessed and primed with CCI #41 military rifle primers. Brass is grade A quality, from a military range so it is true once-fired. May have very small dings, because it is fired brass. Completely ready to load. 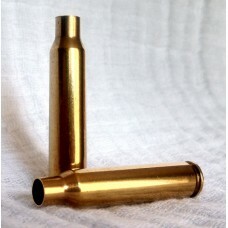 Brass is primed with CCI #41 military primers. Dry polishing to restore the "new brass shine"
At every stage, we inspect the brass to detect and remove cases with anything more than minor dents.